What a great time for grandparent when four of the six (soon to be seven) grand kids visit at the same time. 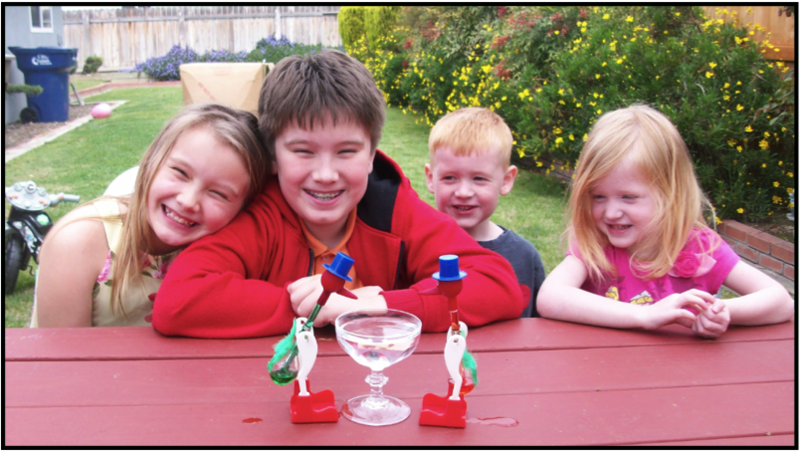 In the above picture, Jordann, her brother Joshua, Asher, and his sister Kate, watch two birds continuously drink from a glass of water. In the background of the picture you can see a large cardboard refrigerator box (the best ‘kid’ toy ever). I interrupted the kids from rolling each other around in the refrigerator box long enough to show them the birds.The birds, like the grand kids, just keep going and going and going. To see the birds in action, just click on this video. Over the years I’ve owned several Drinking Birds. They are made of glass and the normal, unintentional breakage one expects with kids eventually decimated my supply. Any science toy that ‘moves’ (see Cartesian Diver, April 2009 ) holds the interest of kids as they often want to understand why the toy moves. Being made of clear glass, the bird quickly reveals its secret. 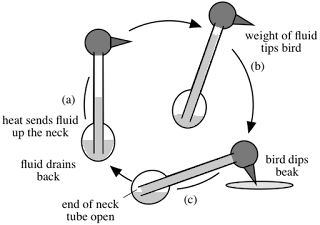 The drinking bird is a simple type of heat engine. It is essentially a thermometer on a pivot with a fuzz-covered head that, as long as it's wet, efficiently cools the top. The difference in temperature between the bottom and top of the bird drives fluid up the bird’s neck. The weight of the fluid tips the bird around the pivot allowing the bird to dip its beak in a pool of water. When tipped, the open end of the tube at the bottom of the bird lets the fluid in the neck drain back down, setting up the next cycle. As long as there is water for the bird to drink, it will continually go through the drink cycle. On humid days the air becomes saturated with water vapor and the oscillation of the bird slows downs or stops. Invert a small aquarium and cover the drinking bird. The air in the aquarium will become saturated with water vapor and the bird will stop drinking. I read somewhere that if the felt is removed from the head and the head is painted white and the bottom black, then the sun or a light bulb can provide the temperature difference required to make the bird 'drink' from an empty glass. Well, I have that extra bird and I think I'll test whether the 'bald' bird works. If it does, I'll report back with a video of the bird in action. Great post pops. The kids loved watching the birds. Thanks for keeping them busy with your fun science projects.